Desserts! Most of us enjoy them, at least from time to time. But, by definition, they are sweet, which almost always means they contain some form of sugar—a problem if you're on a low-carb diet. Most desserts also contain flour, another form of high-glycemic carbohydrate. Does this mean you have to renounce all desserts to keep your blood sugar stable and be successful on a low-carb diet? Not at all. Everyone needs a treat now and then, and that treat can be yummy without sending your blood sugar through the roof. All of these recipes are sugar-free, low-carb, and gluten-free, and they do use sugar substitutes (concentrated liquid sucralose, the sweetener in Splenda, and powdered erythritol are used in most of these recipes). You can substitute your own favorite zero-carb sugar substitutes and the carb count will be the same, but try to keep the amount of liquid or powder the same as the recipe or it might not come out the same. Of course, it's possible to go overboard with desserts, even if they are very low in carbohydrate. Perhaps the main problem is that eating too many sweet things can encourage our taste buds and brains to keep wanting more sweets, so do monitor your own reactions to desserts. Cheesecakes are one of the desserts that are easiest to convert to being low-carb, as they don't contain flour. The only high-carb ingredient is sugar, and a sugar substitute can be used instead. Cakes are trickier to convert, but nut flours such as almond flour can be the basis for a good cake. Basic Low-Carb Cheesecake - This plain cheesecake can be "dressed up" in a number of ways. Strawberry Cheesecake is a favorite, as is this Three Berry Syrup, which can be poured over the top. No-Bake Cheesecake - This low-carb cheesecake recipe is very easy to make, requires no cooking, and can be topped many different ways. Lemon Cheesecake - How to make a cheesecake extra-lemony, but not sour? The secret is in the lemon zest and a sour cream topping that has an extra hit of lemon juice. Pumpkin Cheesecake - Want an autumnal dessert that isn't pie? This just might be for you. Spice Cake - This spice cake can also be converted into a honey cake. Chocolate Pecan Torte - You can mix this up in five minutes, then bake for half an hour and you're done. 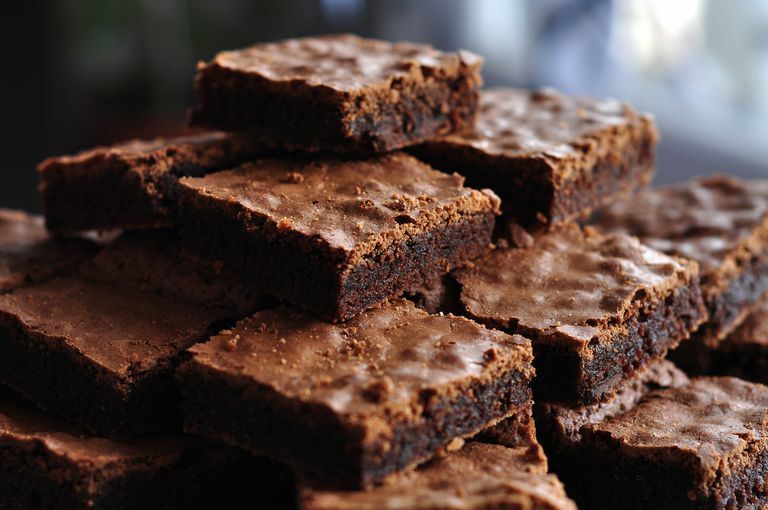 You can also make it in a square pan and cut it into brownie-like bars. Pumpkin Roll with Cream Cheese Filling - This is another great fall dessert. Strawberry Shortcake - This uses a basic muffin recipe as the base of this yummy strawberry shortcake. Italian Passover Cake - A lemony almond cake that's definitely not just for Passover. Lemon Easter Pie - This is a crustless version of a lemon ricotta Italian Easter pie. It's low in calories as well as carbs. Pumpkin Pie - Don't wait for Thanksgiving to make this pie! It is yummy any time and not very hard to make. You can make it in a pecan crust or just plain as a baked pumpkin custard. Fresh Berry Pie - This pie is great with olallieberries, a type of blackberry. The filling is only very lightly cooked, which preserves the freshness of the berries. Almond Pie Crust - This pairs well with the fresh berry pie, but it's a good alternative for most things that need a crust. Good cookies can be the hardest kind of low-carb dessert to make, but these are great, satisfying options. Miracle Brownies - These brownies are consistently one of the top recipes on Verywell. The secret? More (and more) chocolate. Lemon Bars - This sugar-free, low-carb version of classic lemon bars has an almond flour crust. Each one has only three grams of net carb. Haystacks - These easy, no-bake cookies are chock full of chocolate and coconut goodness, but without the loads of sugar in regular haystacks. Cranberry Walnut Cookies - These are a nice cookie for fall or holiday time, or as a healthy lunchtime treat any time of year. Macaroons - With only four ingredients, these cookies are easy to mix up and bake, and they hit the spot with afternoon tea. Chocolate Rum Balls - Need a last-minute holiday gift? You can literally mix this up in minutes. Biscotti - Do you like something sweet to dip into coffee or tea? Check out these biscotti. Chocolate Coconut Cookies - Chocolate and coconut...what's not to like? Here is a variety of different types of pudding-type desserts, from a satisfying pumpkin-apple custard to the light and airy snow pudding. Chocolate Mousse - This mousse is such a rich, intense chocolate that you'll probably be satisfied with a small amount. Lemon Mousse - This is a snap to make once you have Sugar-Free Lemon Curd, which in itself only takes 15 minutes and can be used for lots of other things. Snow Pudding - If you want a very light dessert, check out this lemony "pudding." It's fluffy, not creamy, and is complemented nicely by a Custard Sauce. Peach Melba Parfait - Peach melba is a delightful way to enjoy fresh summer peaches and raspberries, but traditional recipes have lots of sugar. Not this one. Raspberry Fool - This is a wonderful summer dessert when raspberries are in season, but it can be made with frozen berries too (and taste just as good). Sugar-Free Panna Cotta - Panna cotta is a very simple dessert to make, although it's not super-fast; it's gelatin-based, so it takes time to fully set. It can be flavored in many ways. This is a basic vanilla panna cotta that tastes delicious with berries or a berry sauce. Easy Chia Seeds Pudding - This is similar to rice pudding, but easier and beyond fast to make. Instant Pumpkin Pudding - Add some quick nutrition to your kids' dessert by adding pumpkin to a sugar-free pudding mix. Baked Pumpkin Apple Pudding - This is a custard. It is fairly similar to the filling of pumpkin pie, but with extra spark. Coconut in the Lime Jello - This couldn't get an easier (chia seeds optional). Raspberry Squares - You could make these with any kind of berry, but raspberries and strawberries are classic choices. They have kind of a cheesecake-ish vibe. Super-Easy Chocolate Peanut Butter Fudge - You won't believe how easy this is to make...and how good it is! You just mix it up in a bowl and pack it into a pan. Peanut Butter Cups - These sugar-free, low-carb peanut butter cups are better than any "diet candy" you can buy in a store. Hot Fudge Sauce (Ganache) or Truffles - This recipe can be made into chocolate truffles. Add a little more cream to make a hot fudge sauce. Microwave Apple Almond Dessert - This is partway between a baked apple and a quick apple "crisp" (though it's not so crispy from the microwave). This is not for super-low carb phases like Atkins Induction.